Tortillas are one of those things that I’ve always meant to make, but never got around to. 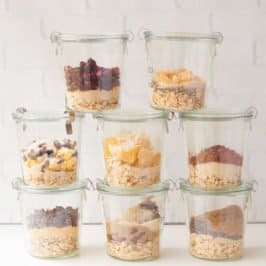 There are so many delicious, relatively healthy, yummy options in the grocery store, that it was always hard to justify the time to make them. 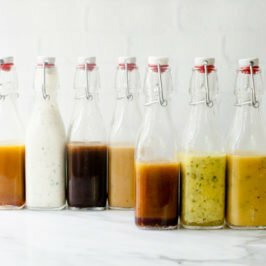 What finally motivated me to take the plunge and make them myself? Flavored tortillas! I had this idea of a coconut tortilla that would work well with savory, spicy flavors (like the portabella fajitas I’m sharing with you tomorrow) or more sweet dishes (like these pear and cheddar quesadillas). So I took to the kitchen and got to working. The ingredient list is pretty short for these guys, which always makes me happy. 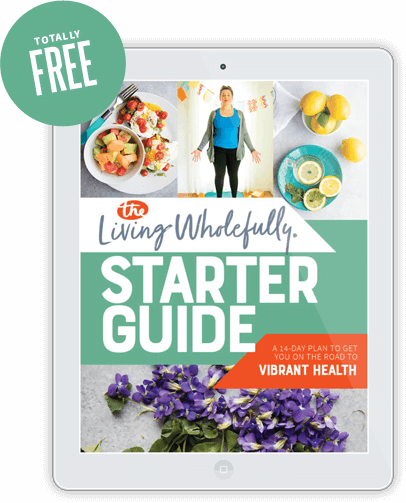 All you need is whole wheat flour, salt, coconut oil and water. Easy, peasy! 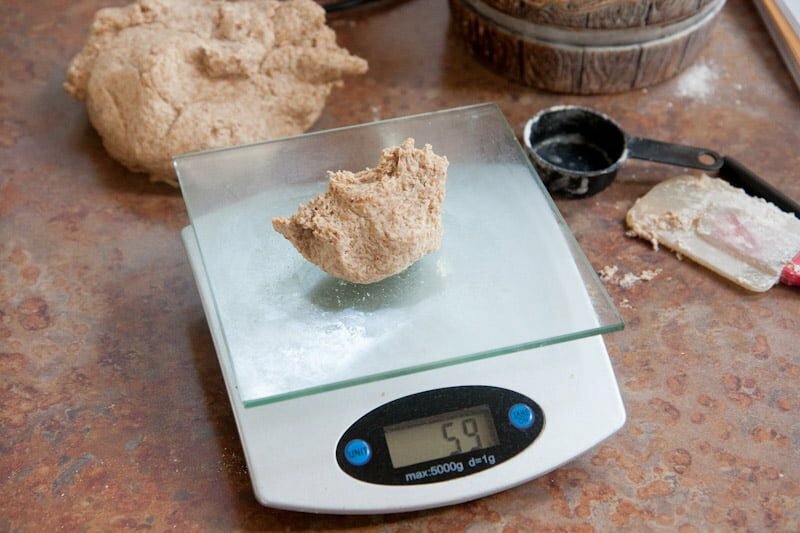 I mixed my tortilla dough up in my mixer, but you can just as easily do this by hand. In the mixer goes 2-1/3 cups of whole wheat flour. 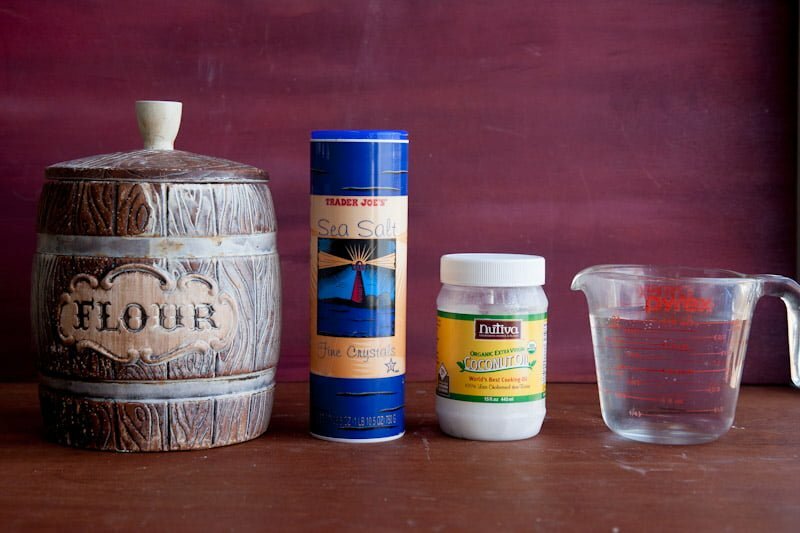 Plus 1 teaspoon of sea salt. And 1/3 cup coconut oil. Coconut oil is solid at room temperature, so to get it so liquidy, I just put the jar in the microwave for a few seconds until it was melted enough to pour. 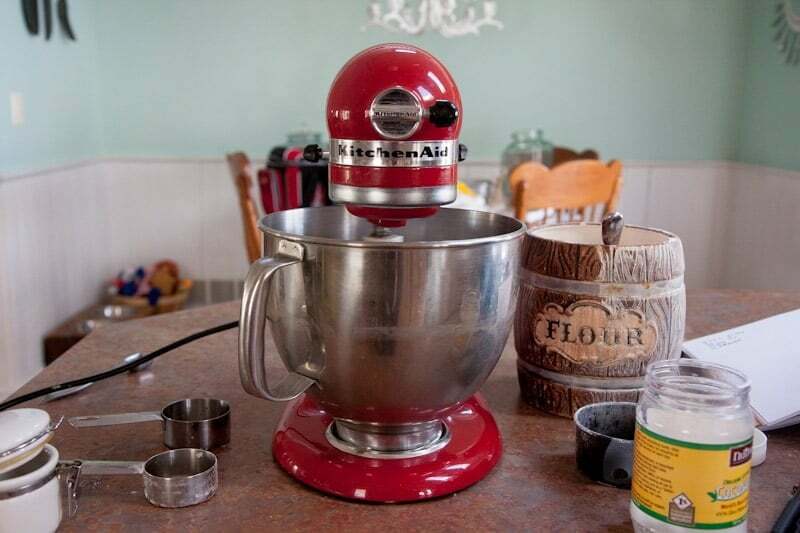 Then, with the dough hook attached, let the mixer run at medium speed until the dough is crumbly and the oil is well-distributed. 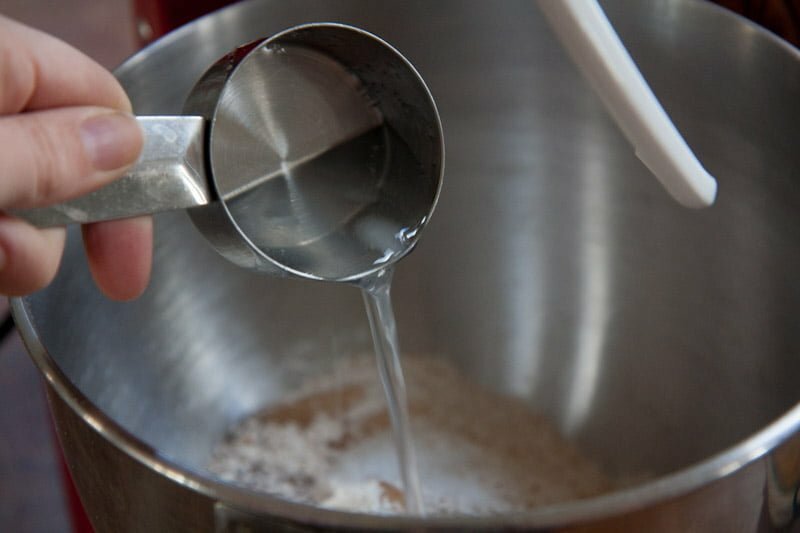 Then, slowly stream in 1 cup of hot water with the mixer running at medium speed. You may need to scrape the sides down as you go. The resulting dough will be pretty wet and sticky (don’t worry, we’ll add more flour when we knead). 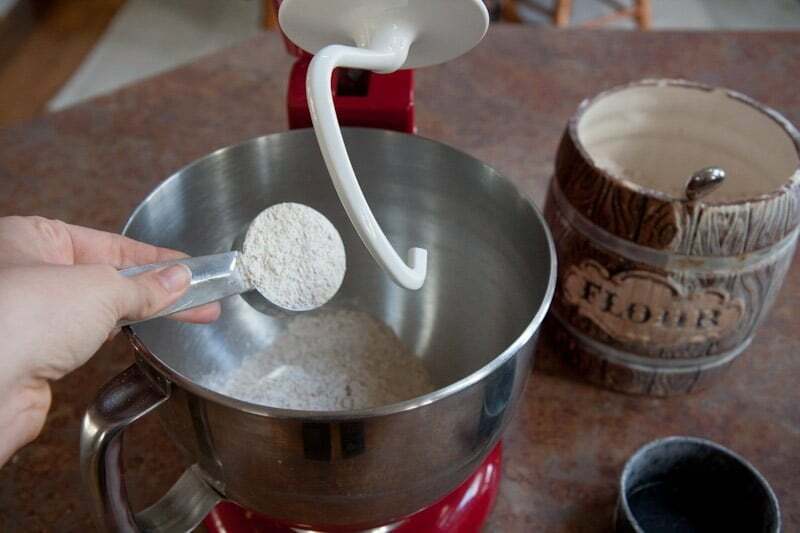 Dump the dough out on a well-floured work surface and kneed—adding up to an extra 1/3 cup of flour as need—until the dough is smooth and soft. Divide the dough into 12 equal pieces. I used a kitchen scale to do this. 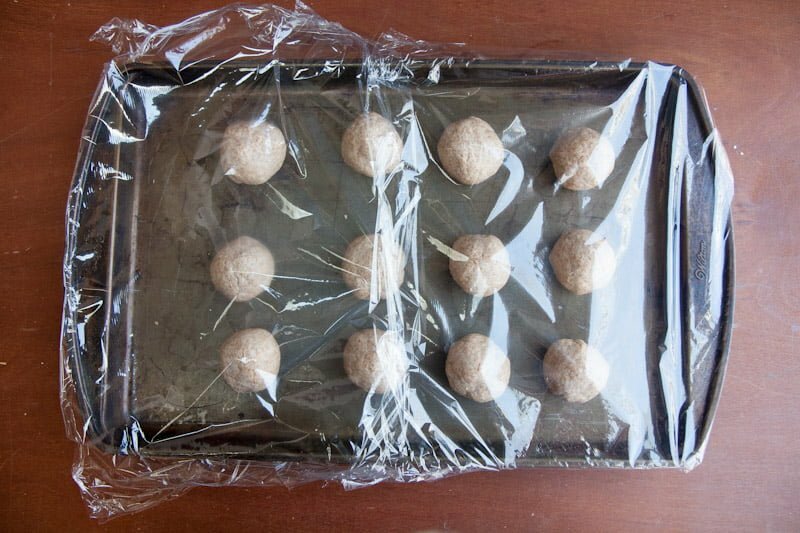 Roll each piece into a ball, flatten slightly, and then put on a baking sheet. 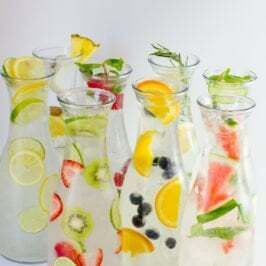 Cover the sheet with plastic wrap or a barely-damp kitchen towel and let rest at room temperature for at least an hour. The longer these rest, the softer and more bend-able they will be at the end. Once the dough has rested, preheat a cast iron or non-stick skillet over medium-high heat. While the skillet is heating, roll out one of the dough balls on a lightly-floured surface until it’s about 8″-10″ in diameter and very, very thin. You want to err on the side of it being too thin, because if it’s too thick, it’ll crack when you go to roll them later. Toss the tortilla in the skillet. I didn’t use any sort of oil or fat, because my cast iron skillet is pretty non-stick, but if you prefer, you can put a touch of coconut oil in the skillet before each tortilla. 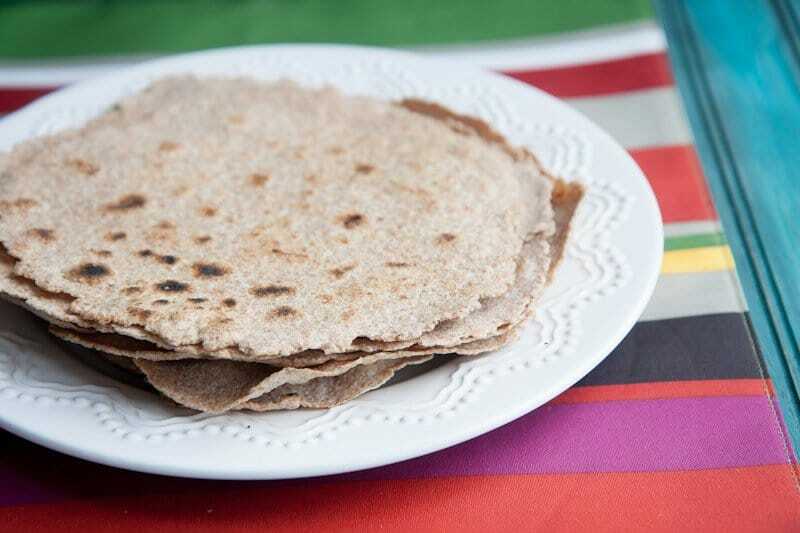 While your tortilla cooks, you can start working on rolling out your next tortilla. The tortilla in the skillet will start to bubble and turn solid-looking (kinda like a pancake). That’s when you know it’s ready to flip! It took me 4-5 minutes to get to this point. Cook the tortilla for another minute or two on the other side and then, it’s finished! Just to keep them soft, I stashed them in a closed zip-top bag while they were still warm. Because of the whole wheat flour, these tend to get a bit hard-to-roll when they are cold, so the heat and the steam keeps them soft and pliable. It took me about 30 minutes to roll out and cook all the tortillas—it definitely isn’t a super speedy process. But the flavor? Oh my gosh, the flavor is so worth it! These are hearty and slightly-sweet with just a tiny touch of coconut-flavor. And they freeze beautifully! Next time, I plan on doubling or tripling the recipe and batch cooking a bunch for the freezer. 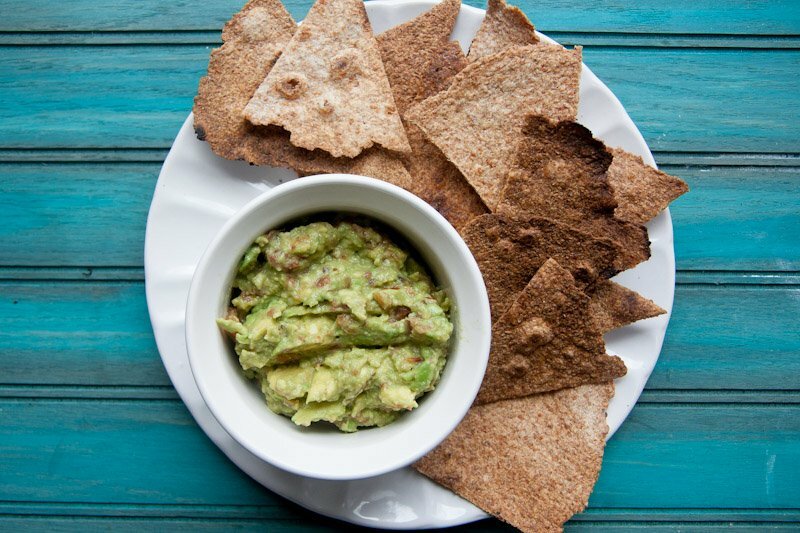 They also make insanely-delicious baked tortilla chips! I used a pizza cutter to slice them into triangles and popped them on a baking sheet under the broiler for a few minutes until the were nice and crispy. They added such a fun and interesting sweet, cocount-y flavor to guacamole and salsa. 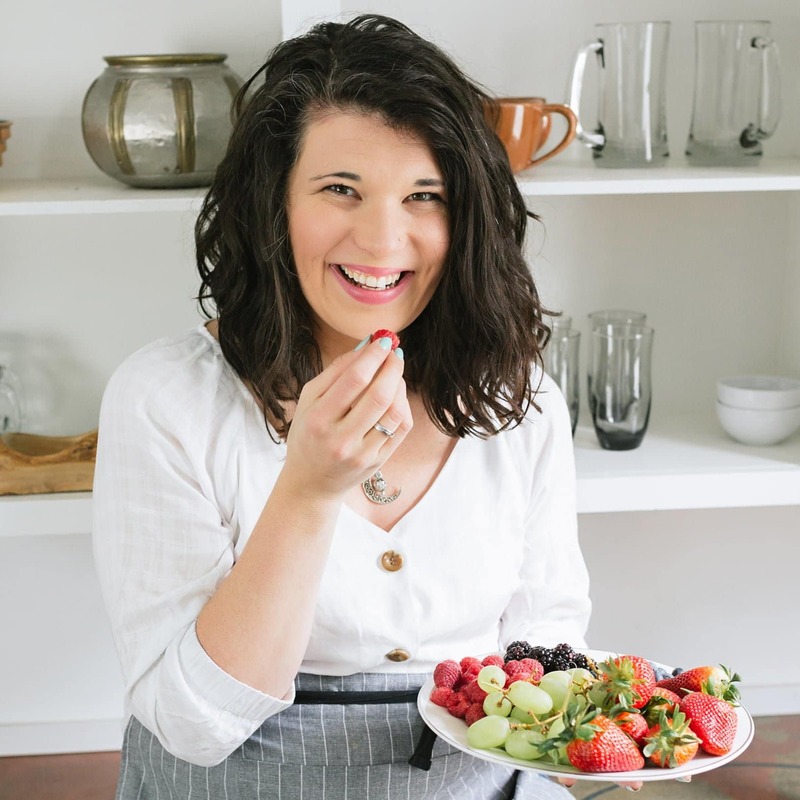 Of course, if you aren’t big on coconut, you can swap out the coconut oil for any other oil that makes you happy, but I definitely recommend trying it out with the coconut oil. So. Good. 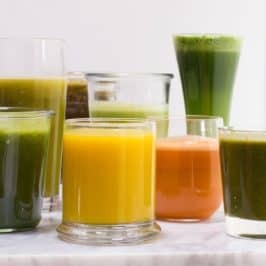 And so good for you! 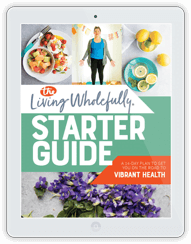 Yay for short ingredient lists, whole grains and healthy fats! Stay tuned tomorrow for those portabella fajitas I promised! They come together in a flash and are so flavorful, easy and perfect for a Meatless Monday meal. 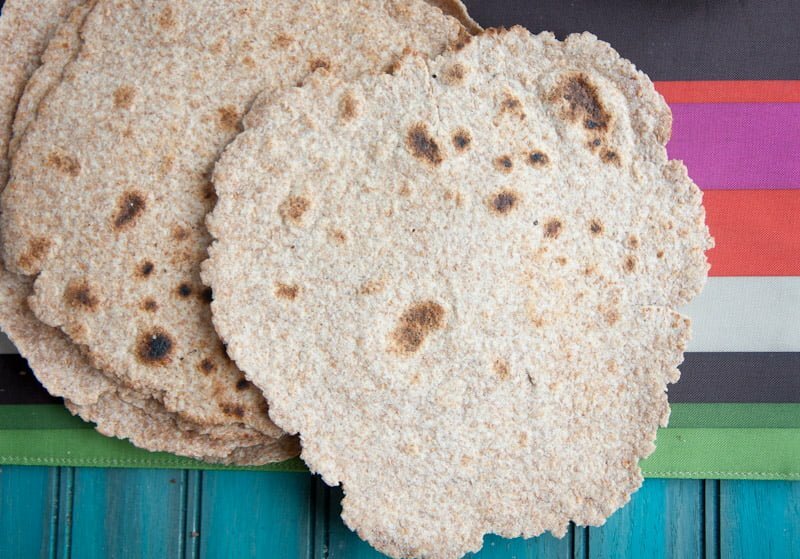 Whole wheat coconut tortillas are great for your next taco night! 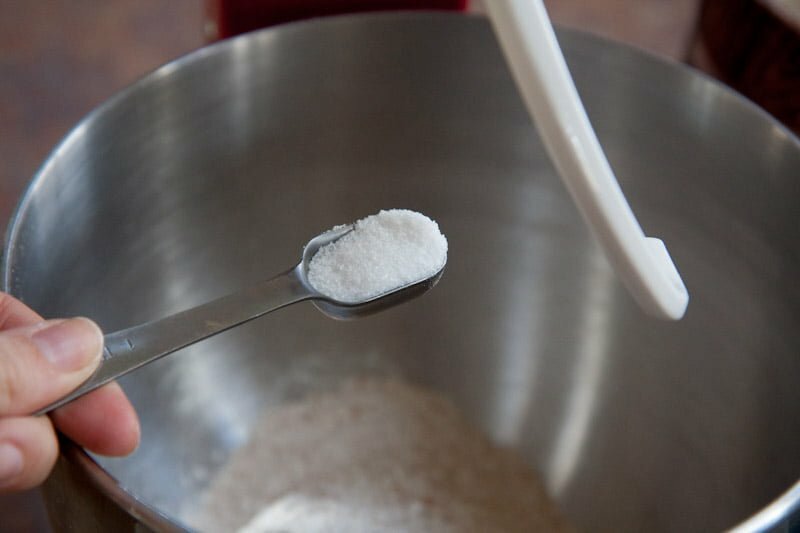 In the bowl of a mixer fitted with a dough cook, add in 2-1/3 cups flour, salt and coconut oil. 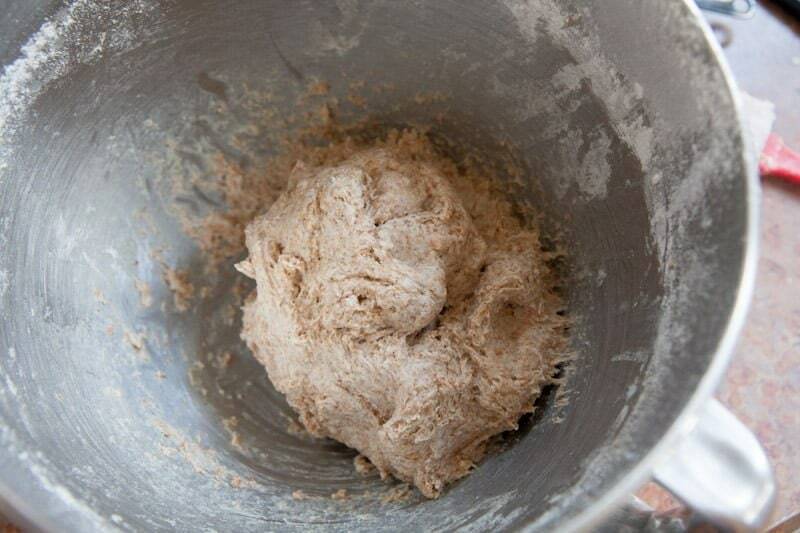 Mix on medium until the oil is distributed and the dough looks crumbly. 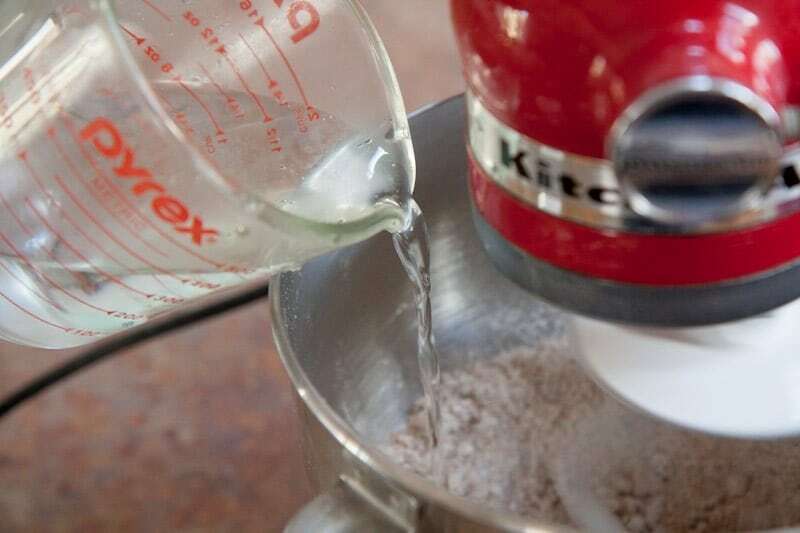 With the mixer on medium, stream in the hot water slowly until the mixture is well-mixed—it will be a wet dough, you may need to scrape the sides as it mixes. Continue to mix for 3-4 minutes. 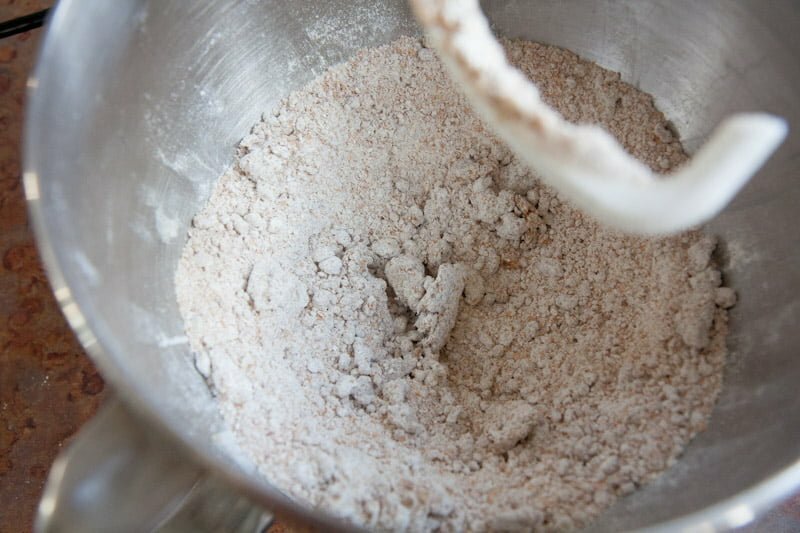 Dump out the dough onto a well-floured surface and knead—adding in remaining 1/3 cup flour—until the dough is soft and supple. Divide the dough into twelve even pieces, roll into balls and let rest, covered on a baking sheet for at least an hour or up to four. 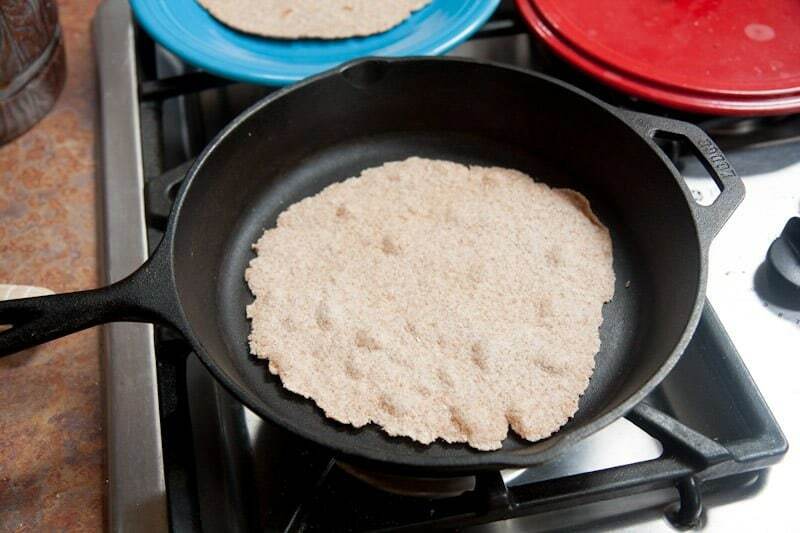 When you are ready to cook the tortillas, heat a cast iron or non-stick skillet over medium-high heat. While the skillet is heating up, roll out one of the dough balls on a lightly-floured surface until they are 8″-10″ in diameter and very, very thin. 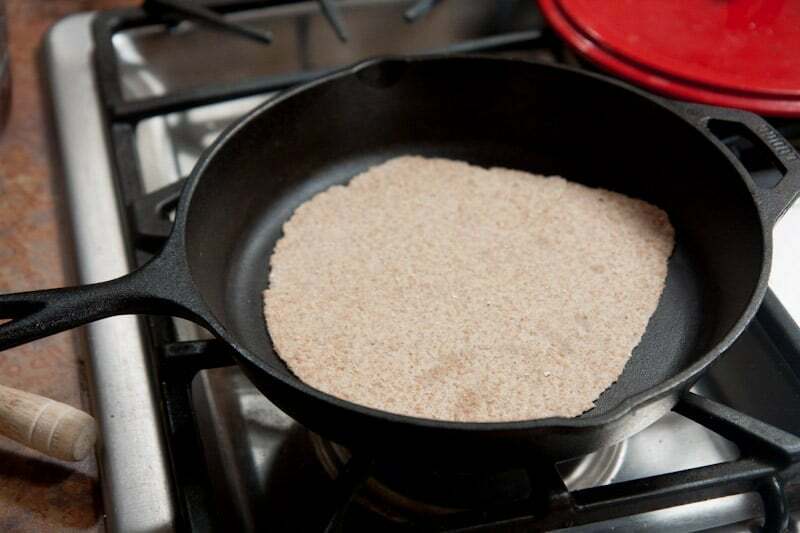 To cook the tortillas, place in the skillet and cook until bubbly—about 4 minutes. Flip and cook on other side for 2-3 minutes. 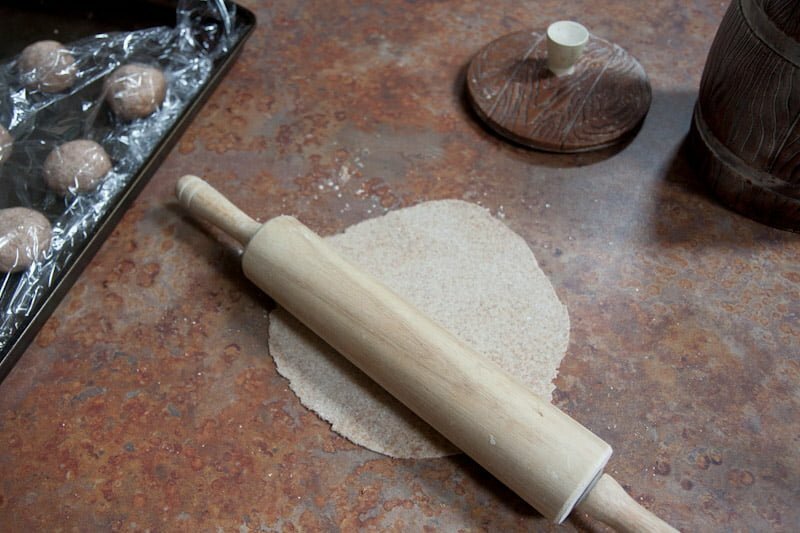 While the tortilla is cooking, roll out next dough ball. 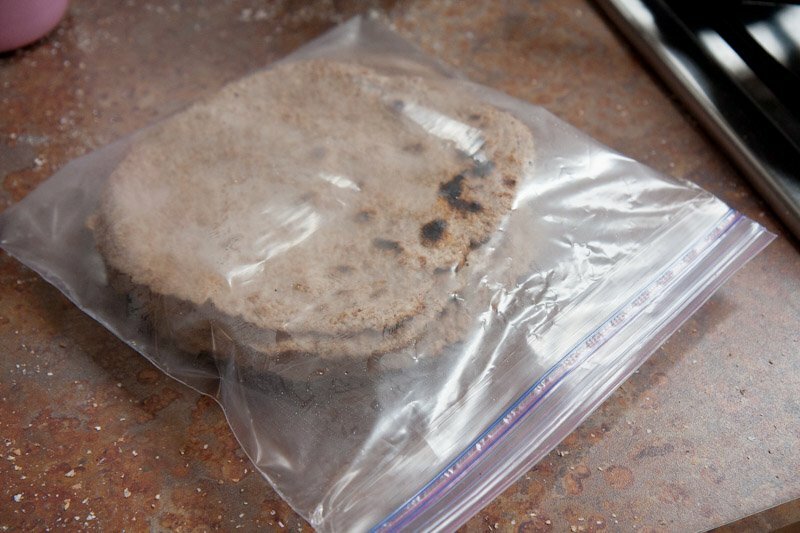 To keep the tortilla soft and warm while the others are cooking, stash them in a closed zip-top bag. 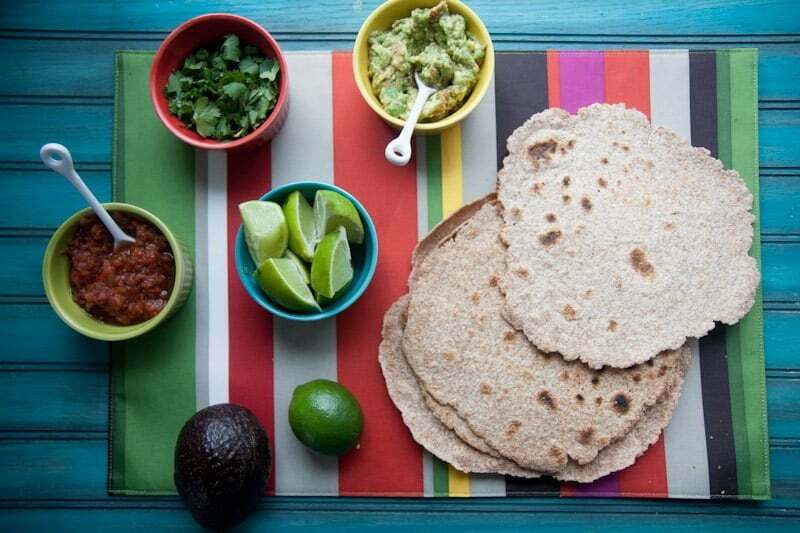 What’s your favorite way to use tortillas? 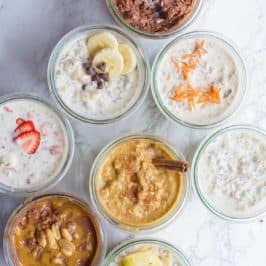 Ohmygosh I can’t NOT make these, I have all the ingredients, I love using my kitchen aid, and I just bought a cast iron skillet! You’ve just opened up a whole new world for me, thank you! I can’t wait to try these puppies…oh the possibilities! Warm tortillas are the best! I prefer thicker ones though, heat them on your skillet before serving they should become more flexible and less likely to tear. 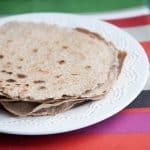 I’ve been making my own whole wheat tortillas for more than three years – but I’ve never tried the coconut oil route. I’ll have to try it next time.